Michael Yeats is an American bow maker living in the Netherlands. His formative years included playing music and working with materials, including nearly all species of wood. 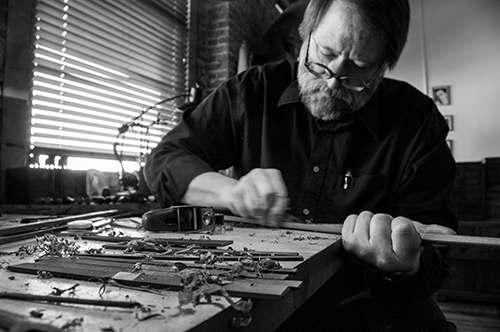 His instrument making career began in 1975 as an apprentice to a baroque and renaissance lute maker, Robert Lundberg. He has made and repaired instruments as varied as guitars, concertinas, and pipe organs. In 1987 he started bow work with William Salchow in New York. In 1989 he started his own business. He has repaired and restored some of the finest bows in the world. 15 years in New York laid the foundation for his bow making career. Over the past 31 years he has sourced only the finest wood for bows. He believes that the best performing bows may only be made from the finest pernambuco. His bows are known for their clarity, definition of sound and superior playing qualities. In addition to bow making, Michael enjoys a good mystery, a great vintage fountain pen, and all things that reflect a creative mind.